Made in the USA using high quality PVC, BPA, and Lead Free Materials. This is a truly innovative bag that allows you to carry your wet and dry items in the same bag. Each Planet Wise Wet/Dry Bag contains a "wet" section that is sewn and sealed for no wicking or leaking AND a zippered dry section for clean or dry items. Planet Wise Wet/Dry Bags are made with a high-quality polyurethane laminate (PUL) inner that is anti-microbial and inhibits the growth of bacteria and fungi - perfect for holding approximately 8-9 dirty cloth diapers. 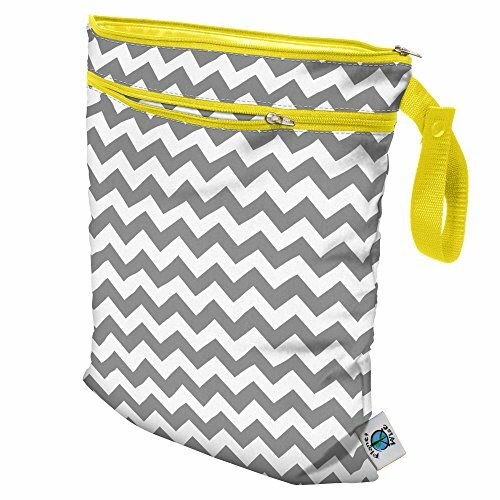 At 12.5" x 15.5" and with a color coordinated snap handle these bags are perfect to carry all your wet and dry items in the same bag. A truly innovative bag that allows you to carry your wet and dry items in the same bag. 2 bags in 1. Keep your dry items dry and your wet items wets. Each bag contains a "wet" section that is sewn and sealed for no wicking or leaking and a zippered dry section along with a clever snap handle for easy carrying. Carry all your items in one bag while keeping your dry items dry and your wet or soiled items separate. Truly an all in one bag.